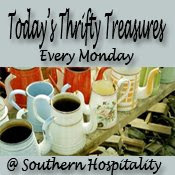 It's Thrifty Treasures Monday again over at Rhoda's Southern Hospitality blog, and I wanted in on the party! Go see what she chanced upon this past weekend when you're done here. She always has something fabulous! I had a MOPS event to go to on Saturday morning, so I had just enough time to swing by a sale on my way to drop the girls at my in-laws. We stopped by a church yard sale just down the street from us (I love church sales! ), and found some good stuff this weekend! I love this Thanksgiving platter! It will be perfect to serve with this year if I can convince T to stay home again and forgo the torturously long trip to Tennessee to see his enormous extended family. I don't have many seasonal holiday pieces, so I really liked this one! I picked up this German gingerbread tin on a whim because I thought it was cute. It has German all over the back and side, and "lebkuchen" (gingerbread) was the only long word besides "Nurnberg" I could pick out. I googled it when I got home and apparently they are pretty collectible. I thought it would be cute in one of the girls' rooms. I couldn't resist this Gymboree turtleneck for Michaela Byrd for next winter. It has salon puppies all over it and says "Beauty Salon." It will look so cute with a little jean skirt, tights, and an adorable bow. Jen found the same wrought iron Southern Living piece at a sale and mentioned in her post that it originally sold for $75! I'm going to use it for my sister's bridal shower this summer. The wooden pedestal thingie has already been spray painted white, and Babe-Pig in the City is awaiting a trip to the VCR when the kids are driving me insane and I need a few minutes to chant "Serenity Now" to myself. $7 for everything I got! Woohoo!!! I would've grabbed that gingerbread tin too! Very cute! Cute things, girl! And yes, The Acanthus votive centerpiece (SLaHOME) is a GREAT score!!! 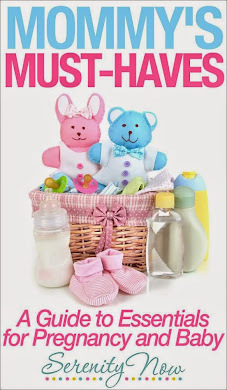 Love all the other things, too! You did good! :) Will be back to check out your other post later. I have to agree with the others, you did good! I love that German cookie tin~so unique! OMG, that lebkuchen tin is adorable. I love it. Hey, how'd you like the German goodies? I gave you an award on my bliggidy blog. Stop by to pick it up when you have a chance. Amanda, those are some seriously great deals! Can't believe you & Jen found the same SL iron piece. I would love to find one of those (although I have NO idea where I'd put it). Guess those things are recyling about now. I've found a couple SL things out there before too. You did good, thanks for playing. That tin is adorable!! That's super cool its a collectible :) Good find and happy thrifting! The tin is so adorable! It would go great with the expensive authentic and adorable German durndel I purchased for your daughter IN DEUTSCHLAND that you have not one time put on her body. Phew. That felt good to say out loud. I'm sorry...I love you and I miss you and see you Saturday! WOoooooo! I love seeing what everyone has found in their treasure hunting. I love the gingerbread tin especially cause it has the cute little bell on the side. I just found your adorable blog. Makes me wish blogging was around when my kids were little. Fabulous finds! You scored! I love the little gingerbread tin.